food+clothing+shelter: Portabella mushroom tacos and Sinatra on a glorious Spring day...what could be better? 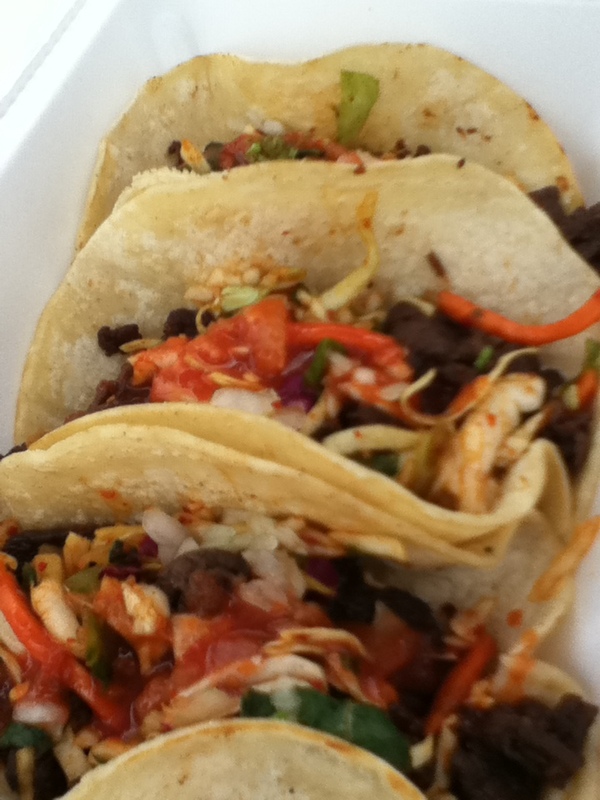 Portabella mushroom tacos and Sinatra on a glorious Spring day...what could be better? I woke up this morning with no definitive plans, other than to take my car for an oil change and tire rotation, and to do the grocery shopping. By eleven, my errands were finished and the rest of the day was all mine! I decided to try a place for lunch that I’d heard about, called Goghee To Go…Korean BBQ infused with Mexican street food. Goghee is “meat” in Korean. As the name implies, there isn’t a dining room…just a few picnic tables by the sidewalk and a tiny parking lot…that was packed when I got there. I drove up to the window and checked out the menu board. Beef. Pork. Chicken. Portabellas. What? Mushroom tacos? Yes! Thinly sliced, sweet and savory Portabellas, wrapped in soft white corn tortillas, with gimchee (spicy pickled napa cabbage, caramelized to perfection) and dressed with zesty sesame soy sauce vinaigrette. I was intrigued. I began to salivate. I placed my order. The girl at the window handed me my trio of Portabella beauties, but the parking lot was still full, so I drove around the corner, pulled into the parking lot of a small market, rolled down the car windows, and tore into my lunch with gusto. The tacos were delicious! Sweet, spicy, crunchy. The food…the sun…the light breeze drifting through my car…I was in heaven! There were lots of people around, so I wasn’t really afraid. He was of an undeterminable age, but my best guess is that he was in his late forties. He was alert…not “high on crystal-meth” alert…just…aware. He was sunburned, kind of grungy, and looked really tired. He thanked me, and began to walk away. “Wait!” I said. “Would you like one of my tacos?” I wrapped one up in a napkin and handed it to him. He looked at it a bit incredulously, took a bite, and made a face. “What’s in this?” he asked. “Portabellas,” I replied. “What’s that?” He asked. “Mushrooms.” I said. He took another bite and made another face. He stood quietly by the car, eating the taco because he was hungry, but obviously not enjoying it very much. On the passenger’s seat of my car was a Frank Sinatra CD. “Wow…you have Sinatra…I really like Sinatra. My favorite is One for my baby, and one more for the road.” “That’s on here!” I said. I started the car, popped in the CD, and cranked it up so he could hear it. I finished off my tacos while he stood there grooving to Sinatra. “Gotta go,” I said, “Have a good afternoon.” “Thanks,” he said. “I’d still like to get a burger at Wendy’s.” “And I still don’t have any cash,” I replied. We laughed, and he walked away as I drove off. Sometimes you just never know what’s going to happen when you wake up in the morning….